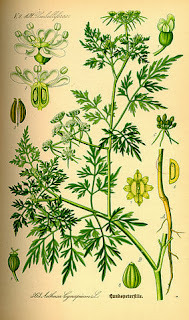 Aethusa cynapium comes from a family of plants that includes the notorious spotted hemlock of which Socrates drank. The plants in the family Apiaceae can be so similar in appearance that the great danger in using them medicinally is to make sure you have the right one! The important differentiator between Aethusa and Socrates's hemlock, for example, are the yellow spots on the stem of the hemlock. We often think of homeopathic Aethusa for babies who are so sensitive to milk that they cannot even take their own mother's milk. As soon as they nurse, they vomit, and the vomiting may be very strong. Even just after eating, the milk can be curdled when it comes back up. Dairy products in general may have this effect, and they may also cause diarrhea with strong pains. The classic picture of a child who needs Aethusa is that they eat, get violently ill, fall asleep and wake wanting to eat again. The symptoms are very sudden and strong. As mentioned above, they often come with drowsiness, weakness and a desire to sleep during the day. 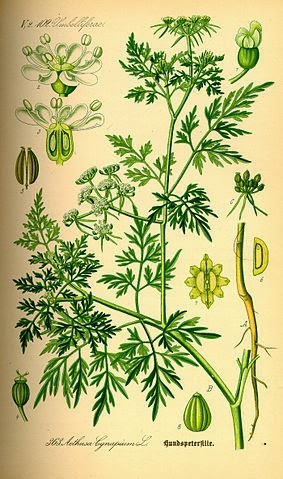 Like in other plants of the family Apiaceae, there may be twitching and convulsions. Often, a person may nibble constantly or have no taste for food at all. There will often be no thirst. The symptoms are brought on or made worse by mental overexertion and study, along with warm weather. They may also be worse between 3 a.m. and 4 a.m. Symptoms such as these may happen when someone catches a stomach bug, or they may be part of a person's long term health picture. People who need Aethusa for chronic issues are famously sentimental, especially about animals. They may be sad and lonely and feel that interpersonal communication is so difficult that animals make better companions than people.